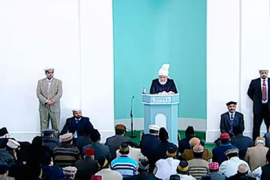 Hazrat Khalifatul Masih continued with his series of sermons relating moral stories and discourses of the Promised Messiah (on whom be peace) as narrated by Hazrat Musleh Maud (may Allah be pleased with him). The Promised Messiah (on whom on be peace) used to tell his children stories with moral. One of the stories was as follow. The flood of Hazrat Nuh (on whom be peace) came because people had become very immoral. When people exceed in sin they lose their value in the sight of God. So in the time of Hazrat Nuh (on whom be peace) a bird’s chick was left all alone, hungry and thirsty in its nest in a tree on a hilltop because its mother did not return home for some reason. It was gasping with thirst. God commanded His angels to rain down so much water in the area that it reached the nest on the hilltop so that the chick could have a drink. The angels replied that sending down enough rain for water to reach the hilltop would mean the rest of humanity would be drowned and destroyed. God replied He did not care. The rest of the humanity did not mean as much to Him as the bird’s chick did. The moral is that when humanity deviates from the right path its significance in God’s sight is less than a bird’s chick. We should self-reflect whether after accepting the Promised Messiah (on whom be peace) we give precedence to faith over worldly matters, do we shun evil and adopt piety. If we are declining morally God will not care for us. The current world situation is there for all to see. In many countries neither the government nor the public is giving each other its right. There is chaos and disorder and even in countries where there is no chaos, people have turned away from God, they abuse and insult His name. There is so much deviation that practices that go against nature are legalised. Natural disasters are occurring all over because sin is abound. But these natural disasters are only a warning sign from God. It is the task of Ahmadis to make the world aware that if matters are not put right God can send down great destruction. There is much talk of fighting for one’s rights regardless how much harm it may cause to others. Below is a story which illustrates the worldview a true Muslim should have in this regard. A Companion of the Holy Prophet (peace and blessings of Allah be on him) brought his horse to sell to another Companion and asked for 200 as its price. The second Companion said he could not possibly purchase the horse for that price because it was worth twice as much, adding perhaps the other Companion was not aware of the going market rate of horses. The owner of the horse said, no, how could I accept more than what I know to be the price of my horse. So much so that they asked someone to mediate and decided on the price of the horse that way. They both demonstrated the spirit of Islam. Indeed, Islam teaches that rather than demand you own rights try and fulfil the rights of others. The minimal good is to give others their rights. Hazrat Musleh Maud (may Allah be pleased with him) said that we are so used to the un-Islamic ways of not giving others their rights, for example the right to go on strikes without due care and attention. These days the junior doctors here in the UK are going on strike leaving patients anxious! Not only are these junior doctors depriving the patients of medical treatment but in places they are playing with their lives! During his recent tour of Japan of Hazrat Khalifatul Masih was asked by a very gentle Christian priest about the definition of peace. Saying, he had not yet heard a convincing definition of peace or how to establish it. Hazrat Khalifatul Masih told him that Islam says choose for others what you choose for yourself. Thus establish each other’s rights and create peace. The priest said he really liked this definition of how to create peace and said it was the first time he had heard it. Indeed, we cannot convince the world of the beauties of Islam without demonstrating them in our practice even if it means that we have to forego our rightful rights. If the other person is a true believer he would not accept what is not his rightful right. It is regrettable that certain cases come before our Qadha board where brother usurps brother and families usurp families. Once Hazrat Imam Hussein and Imam Hassan had a disagreement, as brothers do. Imam Hassan had a very gentle disposition while Imam Hussain had a spirited nature. During the disagreement which was witnessed by other Companions, Imam Hussein was a bit harsh but Imam Hassan remained calm. The next day one of the Companions saw Imam Hassan going somewhere hurriedly and asked him where he was going. He replied he was going to apologise to Imam Hussein. The Companion was surprised at this and said that he was present during the disagreement and had seen that it was Imam Hussein who had been harsh to his brother, so he should be the one apologising. Imam Hassan said he was aware that his brother had been harsh and that was why he was going to apologise to him. He said he had heard that the Holy Prophet (peace and blessings of Allah be on him) had said that whoever is first to reconcile will enter Paradise five hundred years in advance. He said if his brother who had had his way in the disagreement also initiated reconciliation then he (Imam Hassan) would lose on both counts. Hence his haste to initiate reconciliation. Hazrat Musleh Maud (may Allah be pleased with him) said that he had heard the Promised Messiah (on whom be peace) relate this interesting tale. A man went to a Hamman (Turkish bath) to bathe. The owner of the Hamman had allocated various services to the attendants. It so happened that the owner was not around on the day. All the attendants started fighting over washing the man’s head, each claiming, ‘it is my head, it is my head.’ A fight ensued and one of them stabbed another attendant. Police arrived on the scene and the matter ended up in court. The attendants repeated their claims to the man’s head in the court. When the court questioned the bather he said he realised the attendants were being foolish but he was surprised that the court should ask him in the same vein. He said the head was his, it belonged to no one but him! The Promised Messiah (on whom be peace) used to relate this story to illustrate how pointless worldly conflicts are! When a true Muslim says that he is Abdullah (servant of Allah) he relinquishes all his rights and becomes God’s. The Holy Qur’an also refers to the Holy Prophet (peace and blessings of Allah be on him) as Abdullah: ‘…the Servant of Allah stands up…’ (72: 20). The Qur’an explains that true believers submit to God with their person and their wealth. These are two things that man is master of. This indicates that we should not get embroiled in any fight because these two aspects belong to God. True believers should do their utmost to attain their goals and should not be concerned why such and such has been given an office and why such and such has not! Or wrangle over not offering Salat behind such and such Imam. This is what Hazrat Musleh Maud (may Allah be pleased with him) said. Some people may think that people like these do not exist anymore, but sadly such criticisms are still made by some. Indeed, in the time of Hazrat Musleh Maud many companions of the Promised Messiah (on whom be peace) were around and they used to correct people where needed. Now, we are further away in time and need to be that much more attentive and careful. We need to understand now, much more than ever, how to truly become Abdullah. We need to abandon egotism and need to try and attain pleasure of God. When decisions are made contrary to majority votes one gets to hear matters like these. This is a year of Jama’at elections. We need to correct our thought-processes and properly use our right to vote and also accept the decisions that are made. Recently Lajna elections took place in a country and a woman wrote in from there why such and such was given office she is so and so. Complete cooperation should be extended to whoever has been given an office. True believers should try and make efforts with firm resolve and rather than rely on others, should directly involve themselves in matters, then alone are matters resolved and concluded properly. The Promised Messiah (on whom be peace) used to relate a story about a rich man who ran a large langar (public kitchen). Many impoverished people ate daily from the langar but it was badly mismanaged and the owner was not very good at supervising matters. His employees were dishonest. Those whose job was to buy groceries used to buy expensive groceries and in less quantity than needed and some others took some of it home. The malpractices of those who cooked and prepared food at the langar ranged from handing over food to their families or eating it themselves, leaving the storage area open where at night dogs and jackals would ransack and demolish foodstuff. As a result the owner ran a huge debt which he was informed of after twenty years of mismanagement. He did not want to close the langar. He consulted his friends for advice but did not mention his own failings. His friends pointed out to him that the storage area did not have a door and dogs demolished the stored food. There would be much damage limitation if a door could be put up there. So the man ordered that a door be put where food was stored. When at night time the dogs and jackals saw the door they raised a hue and cry as to what would they eat now as this was the eating place for all the dogs of the area! A seasoned old dog among them calmed them down. He said someone who has let his property pillaged for twenty years and did not take notice is not going to oversee if a lock is put on the door or not. He assured them that they could still eat off the store room. The moral of the story is that is a lot of difference between possibly wanting something done and actually wanting to do something. The dogs and jackals raised a hue and cry over what if the man wanted to lock the door but the seasoned old dog said what if he did not want to lock the door, why make the protest! Another childhood story Hazrat Musleh Maud (may Allah be pleased with him) recalled was that of Aladdin and his lamp! Aladdin was an impoverished person who found a lamp. When he rubbed the lamp a genie appeared who made anything Aladdin wanted come to pass. Hazrat Musleh Maud said that as a child he thought Aladdin’s lamp was real and later realised it was not so. However, when he reached old age, he appreciated that there is a phenomenon as Aladdin’s lamp. This lamp does not work on oil but on resolve and determination. Whoever is bestowed this lamp by God makes it work! Owing to the fact that resolve and determination are Divine qualities, when God says ‘Be’ it happens. Similarly, when following God, and in accordance with principles laid down by Him, while acting upon His commandments and praying to Him and seeking His help a person says ‘Be’, it happens. Hazrat Musleh Maud (may Allah be pleased with him) said he was convinced of the properties of Aladdin’s lamp in childhood but dismissed them during adulthood. However, upon reaching old age and after experiencing life for a long period of time he realised that the story of Aladdin’s lamp was true. However, it is a metaphorical tale and the lamp connotes resolve and determination, which when rubbed, makes things, no matter how big, happen instantly. Hazrat Musleh Maud (may Allah be pleased with him) said some people do wish to do something at times but it does not come to pass. This is because their wish is half-hearted and is devoid of the requisites needed to make it happen. It is a mere wish, a thought. This is especially so as regards offering Salat. Many people say they wish to offer Salat regularly but do not. When we do not use all our capacities and do not seek God’s help things do not happen. It cannot be that someone really wants to do something and is not able to do it. Hazrat Musleh Maud (may Allah be pleased with him) said he used to listen to a story as a child and laugh, although the story was meant to be a moral tale and the writer intended it as an analogy of the state of current day Muslims. A family maid used to wake up at the time of sehri but did not fast. The lady of the house thought the maid rose at sehri to help out but as she did not fast the lady thought why unnecessarily inconvenience her. So after a few days she told her not to awake at sehri time and said she would manage on her own. The maid responded in amazement and said, mistress, I do not offer Salat, I do not keep fasts. If I do not even eat sehri, I might as well be a disbeliever! Of course this is an illustration of the state of Muslims, for example their stance on attending the last Friday Prayer of Ramadan. It is comical to consider offering of one Salat as sufficient. Indeed, five daily Prayers are obligatory on all adult Muslims of sane mind and for men congregational Salat is obligatory. Hazrat Musleh Maud (may Allah be pleased with him) said that he heard from the Promised Messiah (on whom be peace) that when a king or leader goes somewhere his attendant goes with him and does not need to seek permission from the host to accompany him. Any dignitary visiting another will have his security and other personnel with him. Likewise, he says, no matter how low our spiritual development we should instil a connection with angels in such a way that wherever they go we will also go. We will be included among their attendants. If they will permeate hearts and minds, we will be there too. Our strength lies in our spirituality and in order to strengthen it further we should connect with angels as much as we can so that we can reach people’s hearts. We will go where God’s light will go. Hazrat Khalifatul Masih said we should remember the basic principle that when we gather, be it at Jalsa or Ijtema, we gather to attain spiritual development. If we are consistent in maintaining the impact of spiritual gatherings, angels will help us. True believer is one who does good deeds, who seeks to be able to do further good deeds with humility and while seeking forgiveness of God (istaghfar). Hazrat Musleh Maud (may Allah be pleased with him) said Companions of the Holy Prophet (peace and blessings of Allah be on him) narrated that when he supplicated God it sounded as if a cooking pot was boiling. Hazrat Musleh Maud said instil purity and righteousness and do not deem that you are being pious because elements of dishonesty can creep in no matter how pious an act. The Promised Messiah (on whom be peace) used to wonder why when people returned from Hajj their hearts had more arrogance and vice than before. Many people do not understand the significance of Hajj but are proud just because they have performed Hajj. He used to relate an interesting story in this regard. An old woman was waiting at a railway station on a cold evening. Someone stole her wrap/cloak. When she felt cold and wanted to put her wrap on she found it missing. She called out, ‘Haji brother I only have one wrap which I am in need of, please return it.’ A Haji sat nearby and heard her. Embarrassed, he returned her wrap and asked her how she knew he had picked it. The old woman replied, in these times only Haji people can do something so heartless. Indeed, we must never assume that we are doing pious acts and have pious plans. Belief comes but with the grace of God and not as a result of what we do. Always keep God’s mercy in view. A seeker who does not consider any other door but the door of God attracts God’s grace. As long as we have God in sight, we will be safe but if we leave His door, no matter how many good deeds we do or good plans we make, nothing will avail. The Promised Messiah (on whom be peace) used to relate that once some jewellery was stolen from the house of either Hazrat Abu Bakr or Hazrat Umer (may Allah be pleased with them both). The servant of the house began shouting who was the wretched person who stole from the house of Khalifa of God! May God disgrace him! It was later found out that the jewellery had been pawned with a Jew and Jew named the servant as the person who had brought it to be pawned. Verbal cursing or professing of obedience is nothing, what counts is practice. One who makes a verbal claim of obedience can be the biggest hypocrite. The Promised Messiah (on whom be peace) related that there was an epidemic of cholera. A man was very critical at a funeral of a person who had died of cholera and said these people kill themselves. There is an epidemic of cholera about and they do not take care and are gluttonous. I only eat a small piece of bread but they stuff themselves and keep dying. Next day there was another funeral and someone asked whose funeral was it. A long-suffering person replied this is the funeral of one who only ate a small piece of bread. Hazrat Musleh Maud (may Allah be pleased with him) said what is the point making empty claims like the man did. Indeed, we can talk about what God has declared. For example, God states: ‘Allah has decreed: ‘Most surely I will prevail, I and My Messengers…’ (58:22) He said: Now, if someone was to say they will crush us, it is not a matter of my strength, I cannot say anything. However, if they say this about Ahmadiyyat, then that can never be because Ahmadiyyat is going to triumph, come what may. We have certainty of fulfilment of Divine promises more than we have certainty about our own life. Ahmadiyyat will indeed triumph, whether in our lifetime or later. Righteousness is what is needed to be part of it. Thus we should try our best, but not in an insincere, hypocritical manner and after making our best efforts we should turn to prayers as much as possible. Hazrat Musleh Maud (may Allah be pleased with him) advised Jama’at to keep optional fasts and Hazrat Khalifatul Masih also advised to fast a few years ago. Which some in the Jama’at still practice! At least forty fasts should be kept, on a once a week basis. Prayers should also be made and optional Salat offered and sadqa (alms) given. In places Jama’at is going through a lot of persecution. If we supplicate to God, just as a baby’s crying generates mother’s milk, help and succour of God will come down from the heavens for us, as it has done in the past. Hazrat Musleh Maud (may Allah be pleased with him) said that it is not in our hand to remove some difficulties. Like the verbal abuse as well as abusive writings about the holy person of the Promised Messiah (on whom be peace) which one cannot bear to read or listen to. There was nowhere to go to seek redress for this and there remains nowhere because no one/authorities paid or pays any attention. At least in the past we were not legislated against, now in Pakistan there are laws against Ahmadis. Courts are bent upon sentencing Ahmadis. There is a great need to cry before God, especially for Ahmadis in Pakistan but also everywhere else. They should turn to God with sincerity, offer optional Salat, give sadqa and fast. We have no other way but God’s mercy. May God enable us to pray in a manner that shakes the very heavens!